The Pig near Bath is a country house hotel that is part of a small chain of boutique hotels. They approached CES Electrical as they were concerned that as a prestigious and highly subscribed hotel in a remote rural location, they should have a standby power supply in the event of power failure. 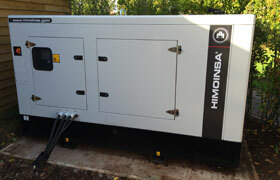 We liaised with the client on site and subsequently installed a Himoinsa 80 KVA single-phase generator with a bespoke manufactured changeover panel. Due to the remote nature of the site we had to manoeuvre the equipment in using mobile cranes. “CES were called in following their supply and installation of a standby generator at our New Forest Hotel to provide a similar set up, they advised the correct size required and installed on time and in a professional manner”.